The Fishery Monitoring Branch of NOAA Fisheries’ Southeast Fisheries Science Center has now released shrimp landings data from the Gulf of Mexico for August 2018. 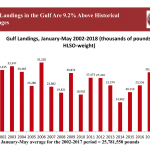 A total of 15.1 million pounds of shrimp were harvested in the Gulf of Mexico in August, down from 16.7 million pounds in August 2017 and 15.4 percent below the prior sixteen-year historic average of 17.8 million pounds. Through the first eight months of 2018, 62.6 million pounds of shrimp have been caught in the Gulf of Mexico, down from 65.9 million pounds through the first eight months of last year. But total landings thus far this year are higher than 2016 (56.1 million pounds), 2015 (60.2 million pounds), and 2014 (59.2 million pounds). For the twelfth straight month, no ex-vessel prices were reported by NOAA for the eastern Gulf (the west coast of Florida). 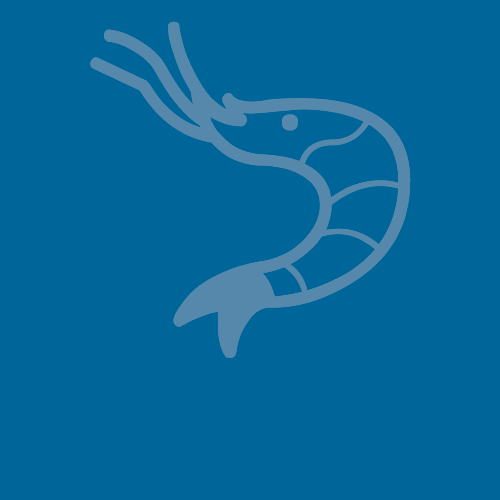 Ex-vessel prices reported for the northern (Alabama, Louisiana, and Mississippi) and western (Texas) Gulf for 41/50 count shrimp were significantly below the ex-vessel prices reported for the same count size last year while, at the same time, ex-vessel prices for U/15 shrimp were reported as being higher than in August 2017.